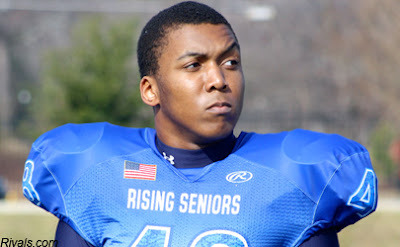 NJ.com reports that Justin Nelson, a 6-2 250 pound DE from DePaul Catholic has verbaled to Rutgers. Nelson had an offer from UMass. UMass will hold its Pro Day on March 4th at Gillette. Working our for the pro scouts will be Stephane Milhim, Nick Speller, Darren Thellen, Perry McIntyre, Mike Cox, Hafis Williams, Deion Walker and several other players. This article by the Orlando Sentinel mentions many Dade County players signed with Northern teams (mentions Lorenzo Woodley signing with the Minutemen) in 2013 and wonders if Miami can regain its former dominance in signing locals. Speaking of the NFL draft, the Detroit News has an article on Central Michigan OL Eric Fisher may be a 1st round draft pick. The article has some of Fisher's results from the Combine. UMass is not the only school to have cranky professors. An Ohio University prof complains athletics are over-funded while the students are using bad grammar. USA Today says the Catholic Seven could break with the Big East as soon as this year. The NY Times says the Big East is considering selling its name. 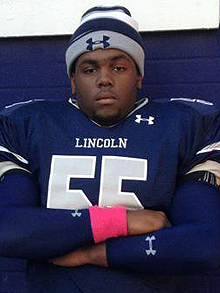 A Kentucky Blog reports UMass has offered to Caleb Samuel, a 6-6 260 pound DT from Macon, GA. Besides UMass, Samuel holds offers from Temple, BC and Kentucky. 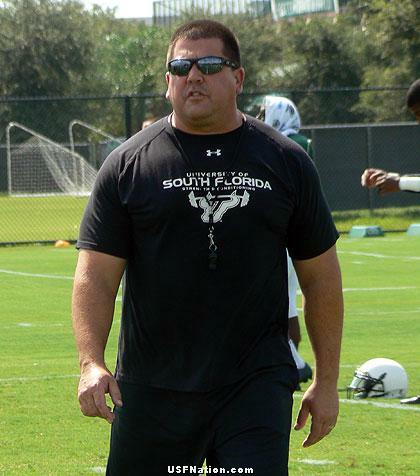 Dave Johnson hired as offensive line coach for UMass. Johnson's Cincinnati bio here. The MassLive article states Coach Molnar will function as his own offensive coordinator in 2013. The MAB Daily Blog has a post on the six MAC players invited to the NFL Combine (including Stephane Milhim). NIU's AD says the recent change in Big Ten scheduling shouldn't have much affect on the MAC. Note that the link has one of those stupid answer-a-question-to-see-the-rest-of-the-article formats. Six Big East schools, including Temple, are upgrading their football facilities. If UMass were ever to be a BCS school, we would have a long way to go. Only 343 days until Letter-of-Intent day 2014! Scout.com reports UMass has offered to Eric Gallo, a 6-3 280 pound OG from Council Rock South in PA.
UMass is Gallo's first offer. Militarytimes.com looks at Navy joining the Big East (mentions UMass). UMass 2011 recruit Jarvis Bentley is currently attending Itawamba Community College in Mississippi. Stephane Milhim's results from the NFL Combine. The ACC released its 2013 schedule. The league plays two MAC teams CMU and Ball State. In addition, unlike the Big Ten, most ACC teams will play a FCS team. Boston College will play Villanova. MassLive has a story about Doug Clark and his success in Mexico. Eagles blog "BC Interruption" has more on Addazio's statement that he intends "to build a fence around Massachusetts". ESPN reports UMass has offered to Tyler Burke, a 6-4 240 pound ILB from Coatsville, PA. This December 2012 article features Burke. This article from November 2012 also features him. Yahoo Sports has a highlight video here. Burke also holds offers from North Carolina State, Maryland, Temple and Rutgers. Matty V. has another story on Kellen Pagel's switch to baseball (pay wall). The UMass Daily Collegian has a story about Victor Cruz's visit to campus for the Dayton game. The addition of Jimmie Reid to the Iowa staff may mean more Hawkeye recruiting effort in New England and Virginia. I don't know if you caught it, but new BC coach Addazio said he's "building a fence" around Massachusetts for Boston College recruiting. Pete Lembo thinks Ball State could replace NIU as the top team in the MAC next year. Another column on the the Big East-ESPN TV deal. An Oklahoma newspaper says the NCAA's new recruiting proposals will make recruiting even crazier. Had a good time at the UMass basketball game yesterday. UMass won. Victor Cruz was in the house tossing t-shirts to the crowd. I got to talk with some other UMass football fans about this year's recruiting. Also in the lobby were a gaggle of UMass football recruits. As you know, Jimmie Reid got hired at Iowa. Kirk Ferentz, the head coach at Iowa, was also HC at Maine from 1990-92. In an interview, someone asks him how the UMass-Maine series went when Ferentz was there. Harry Plumer of MassLive has a story about Cruz's visit. Victor thinks things look bright in both football and basketball. CBS Sports says the Big East and ESPN have agreed to a TV package through 2019-20. Boston.com mentions Cruz's contract negotiations with the Giants. This article from SB Nation has news from the NFL combine, but the most interesting reading is explanations of the combine drills, such as the Bench Press. I've blogged about Thomas Holley, a 6-4 280 pound DT from Brooklyn, NY before. The NY Post has an article featuring Holley. I've blogged about Noah Beh before. 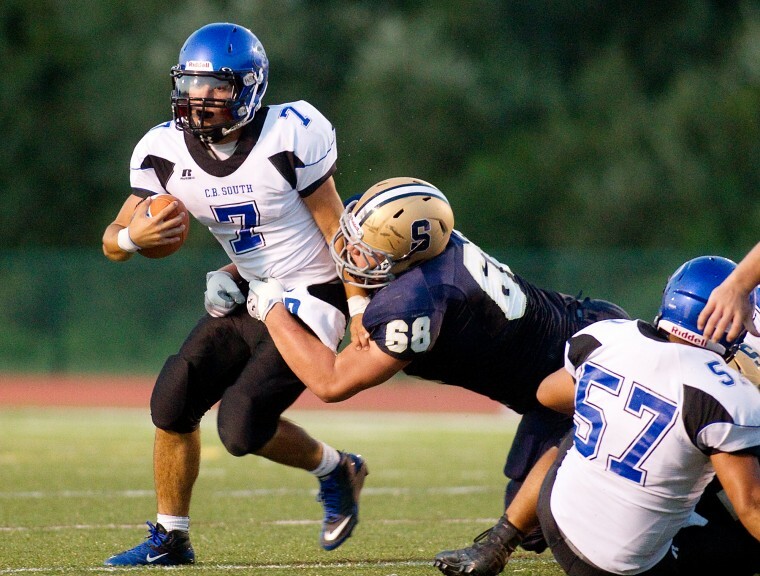 The Patriot News has a recruiting post on the Pennsylvania lineman who is up to eight offers. Nick Underhill of MassLive has an article with Stephane Milhim on his selection to the NFL Combine. Go Stephane! It would be great to have another UMass player in the pros. Former UMass QB Kellen Pagel has joined the UMass baseball team. That's also great news. Kellen will still be a Minuteman. With two seasons of eligibility, he has the time adjust to the sport and hopefully make a contribution (and have some fun). Matty V. has a blog post that Victor Cruz will attend today's hoops game with Dayton. So will Mrs Blog and I. This article mentions Jimmie Reid coaching linebackers for Iowa. The Hawkeyes have Reid's bio up. Another article mentions UMass in connection with the Big East. USA Today says the Big East will sign with ESPN. Mrs Blog and I belong to the 100 Yard Club, as such, we get updates from Coach Molnar. If you follow UMass football, it's the way to help the team win. Join in 2013! As the New Year begins, I’d like to recap some of the best “UMass Moments” from 2012, and to thank and honor all the Minutemen who had a part in them. Captain’s Breakfast – 21 former captains attended. Alumni Game - 33 Alums played in the game, over 100 attended. Post-Game UMass Football Family Reunion – over 300 active players, alumni, coaches, staff and families attended. -550+ Community Service Hours performed in the Spring Semester by UMass Football Players. -Awarded CHAMPS Cup Community Service Category for leading all UMass Athletics team in community service hours. -Bob Foote’s $500,000 contribution to the new Football Training Facility. -11th Annual UMass Football Golf Classic had 92 golfers participate. 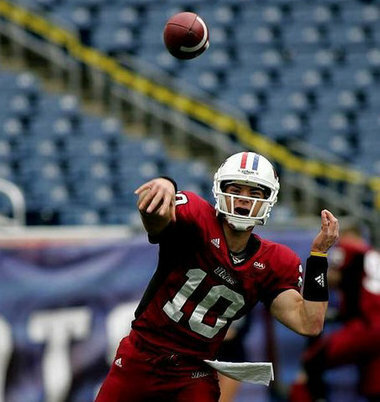 -UMass Football Experience, which was a string of summer camps held on campus and at Gillette Stadium for boys of all ages with over 500 participants. -First Home Game at Gillette with Alumni Tunnel against Indiana University. -First Win as a FBS School against the University of Akron on November 10th, 2012. -Perry McIntyre, Darren Thellen, and Colter Johnson first All-MAC football players. -Re-instituting the “lost” tradition of awarding Varsity Letters. -7 Minutemen active on NFL rosters. -4 Minuteman active on CFL rosters. Sean O'Connor, and Caleb Violette; seven in December, DJ Adeoba, Julian Colarusso, Quinton Sales, Darren Thellen, Jeremy Horne, Tyler Holmes, Charles Thompson. The 2nd ANNUAL SPRING FLING will be on Saturday, April 20, 2013. Many more details to follow during the coming weeks…we do plan on playing the Alumni Game again this year, due to the amount of interest we have received over the last several months. Just like last year, please RSVP your intentions so we can plan accordingly! great, Phil Roland, ‘75 BS, ‘77 MS.
Phil played Runningback for Coach MacPherson from 1971 to 1974. After his playing days were over, he began his career as a football coach at UMass, first serving as a Graduate Assistant for the 1975 season and the Runningbacks Coach for the ‘76 season. After that, Phil moved on to the New England Patriots as a Quality Control Coach for the 1977 season, and his last stop was at Maine Central Institute as an Assistant in 1978. While at MCI, Phil was offered a job with Honeywell and it was then he began his business career. He stayed at Honeywell for 5 years before taking a job at ABB for another 5 years. In 1986, Phil became owner and President of Aquest Corporation, a successful environmental engineering firm based in Somers, CT. In his spare time, he is the Head Lacrosse Coach at Wilbraham & Monson Academy. Phil sums up his life this way: “Everything I have was because I received a football scholarship to UMass”. ESPN says sources saying the Big East is close the to a TV deal with ESPN. If UMass should get a Big East offer now, or in the future, when the league expands, the media $$ would make a big difference in UMass Sports. Current Big East members may lament the decline in revenue now that the Catholic Seven have left, but it would be a godsend for the Minutemen. The New England Patriots Report has an update on the NFL Combine including a paragraph about Stephane Milhim. The Dayton Daily News has a paragraph on the MAC players in the NFL combine (at end of linked article). NJ.com report that John Mara hopes Hakeem Nicks and Victor Cruz are Giants for a long time. Phil Steele has UMass as #109 in FBS in defensive YPG vs offensive YPG. In the Minutemen's case it was four BCS games and a lack of offense than with the defense. 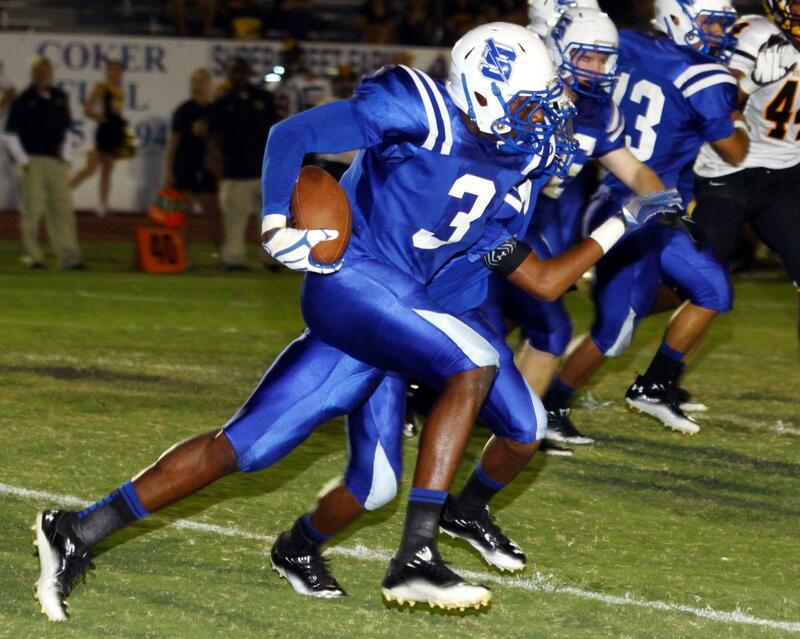 The Orlando Sentinel reports UMass has offered to D'Cota Dixon, a 5-11 179 pound DB from New Smyra, FL. This article from October 2012 also features Dixon. Besides UMass, Dixon holds offers from Louisville, West Virginia, Ball State, North Carolina and Vanderbilt. The MAC football website has an article on the seven league players invited to the NFL Combine. A Bleacher Report writer says the Giants must let Victor Cruz go. UMass starts a three game series with Colorado next year. The Buffaloes are proposing a $170 million upgrade to their facilities. The Miami Dolphins look at their 2012 rookies including Josh Samuda. UPDATE: Our favorite newspaper is up for sale again. Maybe it's future owners will change it's persistently sour view of UMass athletics. I've traveled quite a bit and there is no other state in the Union where the dominate newspaper is "anti" the flagship state university's athletics. SB Nation has a story about D.J. Gillins, a 6-3 185 dual-threat QB from Eagle's View Prep in Jacksonville, FL. Gillins verbaled to Texas Tech in December, but another article says that isn't set in stone. Some Junior highlight video here. Besides UMass, Gillins holds offers from North Carolina, Vanderbilt, Kentucky, Florida International and Troy. UMass OL Stephane Milhim will be taking part in the NFL Combine. Stories from the UMass website and from MassLive. A Kentucky blog has 20 questions about Neal Brown. NESN has an article about who is the greatest QB in Detroit Lions history (includes Greg Landry). The MAC Blog "Hustle Belt" has a story on why the MAC needs a better TV contract. Diversification of the league would add to the MAC's TV desirably. Adding Army would help. The league could have "MAC Challenge" games with teams from other non-BCS leagues. For example, instead of a Thursday night game with Northern Illinois vs Central Michigan, how about Northern Illinois against Florida International? Cincinnati makes a bid to join the ACC. The Hartford Courant says NBC's TV deal might be best for the Bit East. OT, but my old school at UMass, the Isenberg School of Business, has an innovative (and cheaper) online Masters Degree program. NJ.com says Jacquis Webb, a 6-5 320 pound OT from Rochester, NY will attend Junior Day at UMass this week. 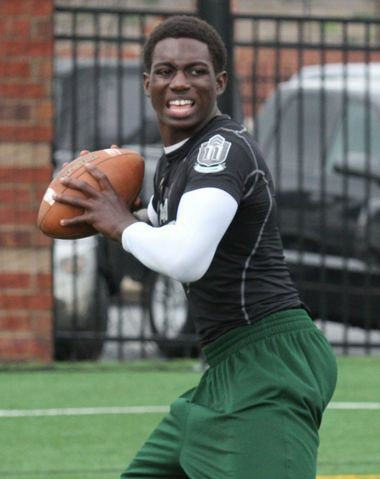 Webb holds offers from Rutgers and Old Dominion. Tampa Bay Times reports that Rohan Blackwood, a 6-4 195 pound DE from Nature Coast HS in Tampa has added an offer from USF. I've blogged about Blackwood before. Recruiting sources say UMass has offered to Patrick Amara, a 6-2 171 pound athlete from West Catholic HS in Philly. Besides UMass, Amara holds an offer from Bowling Green. Spencer Whipple joins the Pitt staff as a graduate assistant. Nevada is looking for a series with a MAC school (mentions the Nick Rolovich connection with UMass). Randell Jette and two other UMass football players meet the kids of Donahue Elementary School. A Bleacher Report writer looks at next year's UMass-Wisconsin game. Western Michigan is talking about new unis and facilities upgrade. Will Victor Cruz work out a deal with the Giants? Rivals.com report UMass has offered to Cortavious Givens, a 5-11 215 pound LB/RB from St. Petersburg, FL. This October 2012 article features Givens. Besides UMass Givens has an offer from Virginia. A Bleacher Report writer comments on Jimmie Reid being named an assistant coach at Iowa. Will Wes Welker's contract situation affect Victor Cruz? Ten ways to get ejected from a college football game. Athlon Sports has the consensus recruiting rankings for the Big East. Boston College is the Northeast team that had a dreadful year recruiting, although recruiting classes take a few years to show up in the standings. Athlon's BC ranking. VanDelay Sport ranks UMass' 2013 recruiting class as 8th in the MAC, ranking the Minutemen ahead of Ohio, Ball State, Miami, Akron and Buffalo. That's a pretty good rating for our second year in FBS considering we have probably the worst facilities in the nation. When our new field house comes on line, Coach Molnar will have something other than a couple of posters to show recruits. Then there is this writer who claims UMass had the worst recruiting class in the MAC. Not sure what recruiting service he's looking at. 247 Sports ranks UMass as 4th in the MAC, VanDelay Sports 8th and Rivals 10th. ESPN ranked UMass in the top half of the MAC. Could the ESPN-NBC Sports rivalry mean financial gain for the Big East? Would the Giants pick Hakeem Nicks over Victor Cruz? A North Carolina paper says UMass has offered to Bo Hines, a 6-1 180 athlete from Raleigh, NC. This article from July 2012 features Hines. Hines' stats including a 4.47 40 from NCSA Recruiting. Hines also has offers from Ball State and Charlotte. An Iowa blog has some comments about Jimmie Reid joining the Hawkeyes staff. ESPN has one week to counter-offer the Big East a media package. The story continues to report UMass and Tulsa are the leading candidates to join the league in football. UMass hoops could be the big loser in the coming realignment if, as the following quote shows, the A10 gets gutted by the Catholic Seven. "The most likely candidates to join the Catholic schools, sources have told ESPN, are Butler, Xavier, Creighton, Dayton, Saint Louis, Richmond and VCU." A USF blog goes slightly ballistic about the Big East's Media package. Forbes says things are going to get much, much worse for FCS schools. Maybe 13 games for FBS schools would help? ESPN says changes hit the non-AQ conferences in 2012. Mentions UMass. 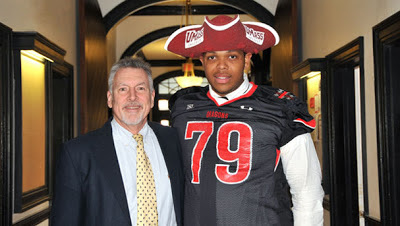 Recruiting services say UMass has offered to Thomas Holley, a 6-4 285 pound DT from Brooklyn, NY. Holley holds seven offers including FBS offers from Florida State, Miami (FL) and Penn State. Jimmie Reid has been hired as a defensive assistant at Iowa. The link has a video interview with Reid. UMass Lowell moves its athletic programs to Division I. UMass AD John McCutcheon says the River Hawks move is neutral for the Minutemen. More on UNI's worries about taking a financial hit from the Big Ten's decision not to schedule FCS teams. Idaho prepares for life as an independent. A Giants blog says Victor Cruz junkies should chill out. Josh Samuda helps educate kids at the NFL's YET center. Recruiting sources say UMass has offered to Noah Beh, a 6-6 245 pound DE from Scranton, PA.
Also has offers from BC, UConn, Maryland and Pitt. Yesterday in the report from the UMass Football Banquet Coach Molnar said Kevin Lovaincy and Johnny Bieren were the offensive and defensive scout players of the year. Sometimes it's hard to remember we had freshmen who didn't play 2012. I don't think I've blogged about Lovaincy before. He's a 6-4 198 pound WR from Cambridge, MA. His UMass bio is here. Bieren is a 6-3 225 pound DE from Nashua, NH. I've blogged about Bieren before. Bieren's other choices out of HS were Harvard, MIT and Carengie Mellon. Yesterday, I had an item about Big Ten teams reducing their OOC schedule to two or three games and I speculated it might lead to less MAC games with the Big Ten. It turns out that the Big Ten will drop all FCS games. That will really hurt the FCS Division as those money game are vital to their finances. Football Scoop has "Is this the death of the FCS Division as we know it?" UNI says the lack of FBS games could be "devastating" to their program. I missed the UMass Football Banquet because of my trip, and I haven't seen a write-up on it anywhere, so I'll post Coach Molnar e-mail newsletter. Note that the original e-mail contained Greg Landry's e-mail address, which I redacted. On February 4th, the 2012 UMass Football team held its annual banquet. Not only were the 2012 Seniors honored with a gift of their home game jersey, but a number of awards were presented to a group of very deserving players. I have a lot of information that I am going to share with you this spring; and a source of that info is our new feature, "MINUTEMAN UPDATE", highlighting what Minutemen of the past are doing now! The first MINUTEMAN UPDATE highlights Massachusetts great, Greg Landry. Greg writes "For the past decade, I have been working in the Detroit area as a Manufacturer Rep. Companies that I represent produce metal and plastic parts. My clients are primarily tier 1 suppliers to the automotive OEMs. Last fall, I was inducted into the National Polish Hall of Fame. I still have a relationship with the Detroit Lions, as a member of their Alumni group that does charity and good will events in the Detroit area. My five children are working here in Detroit and in New York. Jeannine and I are blessed with 4 grandchildren." We are always trying to find ways to reach our most valuable resource -- the Minutemen who have gone before us, who have paved the way so future UMass Football teams have a legacy and a tradition to live up to. Please send us the email address of any Minuteman who is not receiving our letters. Over the last year, we have added over 100 football alumni to our database, but there are many out there who do not receive our letters. Help us grow and stay together as a football family. God Bless and Go UMass! Wicket Local Rosindale has a story about Peter Ngobidi's signing with the Minutemen. A Villanova hoops blog looks at possible additions to the Catholic Seven, including UMass. If the Minutemen were picked for that league, we might choose to stay in the MAC in football. The Big Ten is moving to 9-10 league games by 2014. That might impact the number of OOC games with the MAC. Playing a Big Ten team is a big deal for the Ohio and Michigan based MAC teams, but UMass probably won't care. Sports Illustrated has a story about the Big East moving to a NBC Sports TV deal. An ESPN writer points out the Big East did pretty good against BCS teams in 2012. There will be no update on the blog tomorrow. The way the travel arrangements worked out, I'll be toast by the time I get home. There's been some rumors that Penn State would be looking to ditch it's scheduled game with UMass in 2014. This article discusses the Nittany Lions 2014 schedule. Several commenters have mentioned that Coach Molnar used one of the open coaching positions to hire a dedicated football strength coach. I don't I've linked to hiring article. The UMass website has a story covering Coach Golden's hiring. The videos are not available in this article, but it relates his success with the Bulls. This video says Coach Golden likes to see success. Philly.com says when the Catholic Seven split, the Big East wants to keep the Name. Eli Manning and Victor Cruz were named "best dynamic duo" in the NFL. John Mara says Victor is asking for too much. 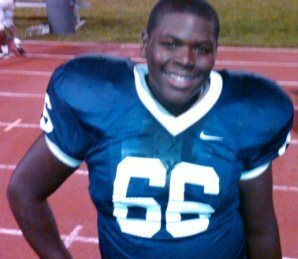 NJ.com has a story Juwann Bushell-Beatty, a 6-6 325 pound OL from Paramus, NJ. I've blogged about Bushell-Beatty before. A major Boston newspaper has an article with a positive spin on UMass football. Before clicking on the link make a guess which one. Mike Dawson gets a mention in this article by ESPN Boston about the NFL and the Pats. Shane Huber's signing with the Minutemen gets some ink by the Hudson Reporter. ESPN Basketball reports the Big East has a TV package offer by NBC. The story says UMass and Tulsa are the "leading" candidates for admission into the league. 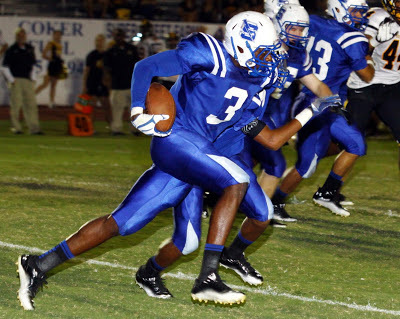 Darren Hambrick, who had a UMass offer ended up signing with the University of Nebraska at Kearney. I've blogged about Hambrick before. Well, the convention I'm attending ends tomorrow and then it's back to Jaffrey. For those of you digging out from blizzard, I want you to know it's also been tough here on Maui. The UMass Daily Collegian has another story about Lorenzo Woodley's signing with the Minutemen. Andy Katz of ESPN has more Big East breakup rumors (again mentions UMass). The Herald News has an article about former UMass OL Nick Salmon. I saw Salmon play and he was indeed an outstanding player. There have been several articles about Chip Kelley's assistant coaches in Philly who included Jerry Azzarino and Bill McGovern. There's one here and here. Former UMass football player Doug Clark is now a national hero in Mexico due to his heroics in the Caribbean World Series. Mass Live has an article. ESPN has the story and video. Clark was good player for the Minutemen. I believe he led the team in receptions one year. 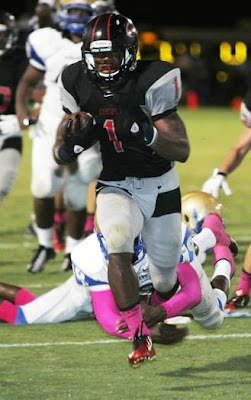 Sony Michel, the younger brother of Marken Michel is one of the top recruits in the nation for 2014. Yesterday I talked about the offensive line and UMass' dismal running game. The addition of two RB's in this year's recruiting class as well as the offensive line mentioned yesterday have the potential to seriously improve the Minutemen's effectiveness this year. Harry Plumer has a story about the whirlwind process that brought us Lorenzo Woodley. I think Delquan Mack will also be a valuable addition to the UMass backfield. The 6-1 245 pound power back should improve our short yardage game. This article features Mack and his signing with UMass. In 2012 UMass went 74/305 36% on 3rd downs and 14/35 40% on 4th downs. Mack could make an immediate impact there. Seacoast online has a story about Logan Laurent's signing with the Minutemen. 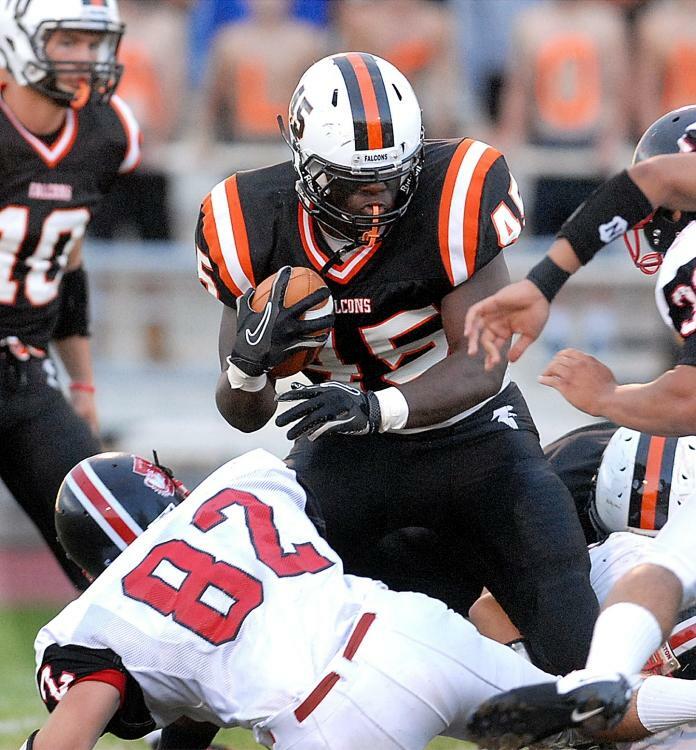 This article features UMass recruit Arthur Williams. "UMass, currently in the Mid-American Conference, but slated to move to the Big East for the 2014 season, is a big step to take, both football wise and scholastically." Matt Sussman has an article on the imaginative use of hashtags by Coach Molnar and his staff on LOI Day. Former UMass kicker Ian Maltz has signed with Albany. 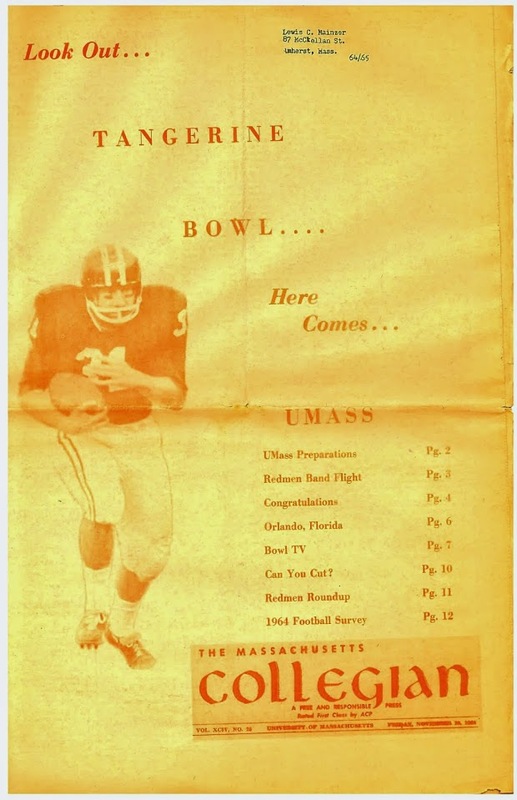 The Bangor Daily News has an article on the University of Maine's 2013 schedule and its two FBS games (including UMass). UPDATE: 247 Sports ranks UMass' class as tied for third in the MAC. And 101st overall. Most other sites haven't added Woodley yet. A quick comment on yesterday's recruiting class. We'll have all Spring to hash things over, but one thing jumps out--- offensive linemen. Remember how well we played in the first Michigan game? We had TWO all-conference running backs and an experienced offensive line. We ran the ball, shortened the game and looked good doing it. This year our biggest failure was UMass' inability to run the ball. We averaged 89.6 yards a game and 2.6 yards a carry. That was good for a bottom five ranking in all of FBS for 2012. Taking out Cox's 200+ yards against Miami of Ohio, we could dead last in FBS rushing. look really sad. For the play action pass to work, the defense has respect the run somewhat. So the upshot is we really need to improve our running game. And it all starts up front. It'll take a couple of years for before this year's recruiting class hits its stride, but the offensive linemen we recruited this year will make us competitive in the future. Offensive linemen don't make your recruiting class look good on paper because they don't get a lot of "stars' for people to talk about. This class will pay dividends in the future. Of course an All-Conference RB wouldn't hurt either. I wrote the above before checking the morning news. Bingo. Lorenzo Woodley signs with UMass. According to ESPN Woodley was the highest rated recruit we signed. Logan Laurent has two articles here and here. QB Todd Stafford signing article here. Nj.com on Nate Crutchfield's signing with the Minutemen. E.J. Burston and Shaq Harris here. Harry Plumer has highlights from UMass' signing day. Note that we still have three scholarships to give and there may be more transfers. The UMass website has the 18 recruits so far with bios and video. Every year I get more hits on LOI Day than I got on the day UMass played Appalachian State in the National Championship game. This is a big class for UMass. The Minutemen had some FBS level players when we moved to the MAC last year--- but not enough. Coach Molnar's freshmen were a good start. Kessan Messiah made an impact all by himself. Once he started, the long runs like Indiana made during our first home game became a lot rarer. The 2012 class was impressive given the short time Coach Molnar and staff had to contact the recruits. 2013's class will be another notch forward. Our biggest needs are offensive linemen, quarterback, linebackers and wide receivers. UMass' signing day central. There will be video later and recruiting updates all day. MassLive's Harry Plumer has a live LOI Day chat. 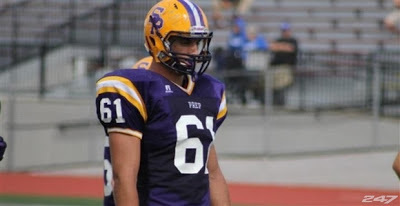 MassLive has a signing day profile of OL Richard Queen. MassLive's signing day profile of OL Terrell Correia. 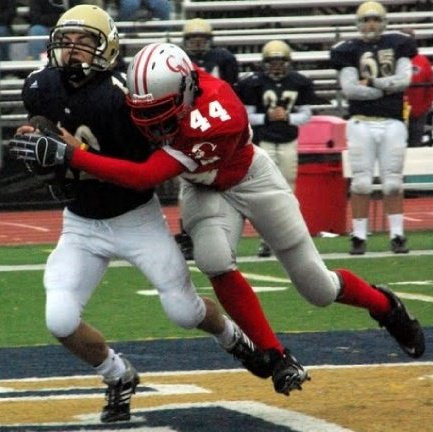 MassLive's signing day profile of LB Peter Ngobidi. NJ.com has a story on Shane Huber signing his LOI. Enoch Asante signs with UMass. I've blogged about Asante before. 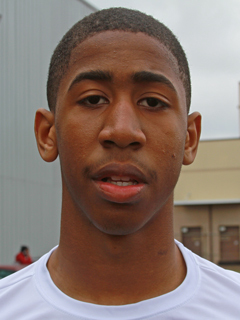 John Johnson commits to BC over offer from UMass among others. Mike Tyler DE chooses Stanford over UMass and others. A Michgan Blogger says WR Ricardo Miller transferring to UMass. Miller's Michigan bio. Good Morning from Maui. Some early LOI day articles. MassLive has signing day looms large for Charlie Molnar. Matty V. has can Twitter influence a recruit's decision to attend UMass? Matty also has UMass is in the running for a three-star recruit (being Tweeted as above). Sharif Custis' next rebuilding project is UMass. I've blogged about Custis several times before. Coach Molnar visits Our Lady of Good Counsel in Maryland. 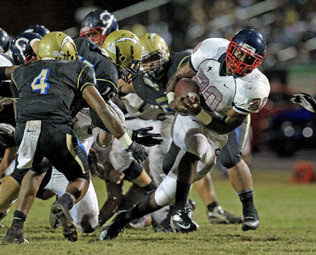 The Miami Herald says Lorenzo Woodley, a 6-2 210 pound RB from Columbus HS in Miami visited this weekend. Relevant quote from the article:"Woodley took an official visit to Massachusetts this past weekend and told Merritt he enjoyed the trip." This article from November features Woodley. Georgia Tech, Nevada and Kent State have also been in contact with Woodley. Good Morning! I'm flying to an astronomy conference today, so I'm getting an early start on the blog. It's before the morning news cycle, so things might be a little sparse. Matty V. says James Ihedigbo is the latest UMass player to win a championship in one of the four professional sports (paywall). A University of Maine sports blog looks at former CAA players in the Super Bowl including James Ihedigbo. The Boston Herald says James Ihedigbo is one of many Ravens with New England connections. Ihedigbo said John Harbaugh made the Ravens believers. The Miami Dolphins site says Josh Samuda has a year to remember. You are invited to join Head Football Coach, Charley Molnar and his staff as we announce the 2013 UMass Football recruiting class. Coach Molnar will present and discuss the 2013 recruiting class. The event is FREE and open to the UMass Community. Complimentary refreshments will be provided. Following the presentation at 6:30 pm, a shuttle will be available to transport those fans who wish to attend the men's basketball game vs. Rhode Island, to the Mullins Center. Multiple sources say that Arthur Williams, a 6-3 190 pound Safety from Sebring, FL has verbaled to UMass. This December article features Williams. Chose UMass over offers from Florida International, Buffalo, Western Kentucky and South Alabama. Exciting Super Bowl yesterday. The Super Bowl has a special meaning for Mrs Blog and I. A long time ago a friend invited me to a Super Bowl party. One of the women attending the party seemed really nice, but I really didn't get to talk to her much because she had my friend's kids in her lap most of the time. The Monday after the game, I called my friend and asked if he knew how I could get in touch with her. He gave me her number; I called and asked if she wanted to go out to dinner sometime. Our 30th wedding anniversary will be this year. A UMass Daily Collegian writer advises on how to throw a great Super Bowl party. James Ihedigbo had a monster hit on a kick return and was in on the final tackle of the game. More on the March Coaches Clinic held in March at Gillette. If UMass should not get an invite to the Big East this year, that doesn't mean there won't be more chances in the future. It looks like conference realignments will go on for some time. The Big 12 is now looking to expand. iSports Web ranks the coaching hires after the 2012 season. Boston.com has a short article on Tyshon Henderson verbaling to UMass. He's a 6-7 320 pound OT from Middletown, RI. The Providence Journal has a December 2012 update on him. Relevant quote from the Journal: "He was both first-team All-ISL as well as an All-New England selection. On defense this season, he had 56 tackles, including 25 solo stops. He had eight tackles for a loss and forced four fumbles. He also was a force on the offensive line, providing near-perfect blind-side protection for his quarterbacks. "